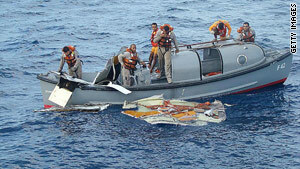 Investigators still don't know what caused an Air France jet to crash into the Atlantic Ocean. (CNN) -- Investigators probing the June crash of an Air France flight in the Atlantic Ocean still do not know what brought the plane down, who was at the controls when it crashed, or what the pilots did in the moments leading up to the disaster, according to a new report released Thursday. "At this stage ... it is still not possible to understand the causes and circumstances of the accident," investigators said in the report. Flight 447 -- an Airbus A330 -- went down in stormy weather in the Atlantic Ocean June 1 while flying from Rio de Janeiro, Brazil, to Charles de Gaulle Airport in Paris, France. All 228 people on board were killed. Most of the bodies were never recovered. France's air accident investigation agency, the BEA, released its second interim report into the crash Thursday. It had been planning a news conference at the same time, but canceled it because of snow in Paris. The plane hit the water belly first, essentially intact, studies of the debris and the bodies that have been recovered show. Oxygen masks were not deployed, indicating that the cabin did not depressurize, the report said. Automated messages sent from the plane in the minutes before the crash showed there were problems measuring airspeed, the investigators said. But that alone was not enough to cause the disaster, they added. "Inconsistency in the measurements of airspeeds was one of the elements in a chain of events that led to the accident, though this alone cannot explain it," the report says. Large parts of the plane -- including the flight data recorder and cockpit voice recorder -- have never been found, leaving investigators without key pieces of the puzzle. Investigators are preparing to begin a new search for the recorders in February, the report said. But the area where the plane went down is far out in the Atlantic -- two to four days for ships from the nearest ports in Brazil or Senegal in west Africa. The underwater terrain is rough, with great variations in depth -- that is, underwater mountains and valleys -- over short distances, the report says. The new search will involve air accident investigators from the United Kingdom, Germany, Brazil, Russia, the United States and France, as well as the U.S. Navy. The search is planned to last 60 days, the report said. Jean-Paul Troadec, director of the French investigation bureau, told reporters earlier this week that the new search, about 1,000 kilometers (600 miles) from Brazil's northeast coast, will involve sonar and robot submarines. Troadec was in Rio de Janeiro to speak to the relatives of the 58 Brazilians who were on board, the French news agency AFP reported Sunday. "We tried to convince the families that we are conducting the investigation with the full intention of getting to the truth," he said. Tests have already brought into question the performance of pitot tubes, which measure the pressure exerted on the plane as it flies through the air, and are part of a system used to determine air speed. Before it crashed, Flight 447 sent out 24 automated error messages that suggested the plane may have been flying too fast or too slow through the thunderstorms, officials have said. The European Aviation Safety Agency issued a directive in late August requiring airlines to replace pitot tubes manufactured by Thales Avionics on Airbus A330s and A340s. It said airlines should replace them with other Thales tubes and those manufactured by Goodrich.